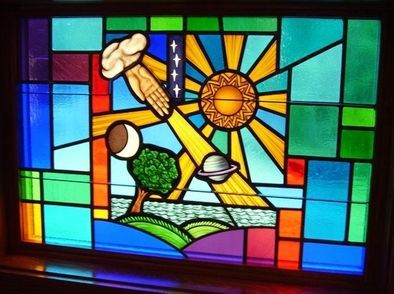 At Laws Stained Glass Studios, we define "artwork" as the symbols and/or scenes that are painted on the glass. Our artists make a charcoal drawing (referred to as a cartoon in stained glass) and use that drawing to paint on the glass. We can make any symbol or scene that a church wants, but it is more expensive to customize. We offer many standard Biblical scenes and symbols in different sizes that are less expensive. All of our artwork is made at our studio in our art department where is baked and fired. All of our windows are custom-sized. They are made the size to fit the existing openings or architectural plans. 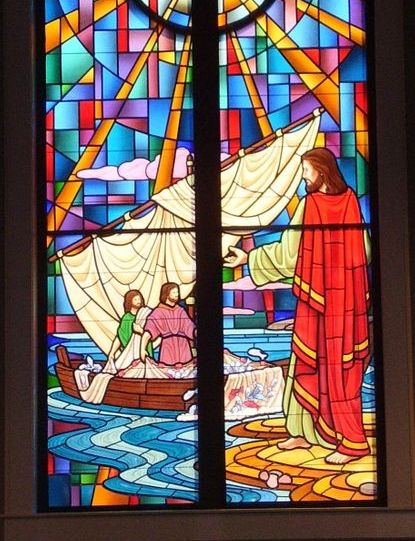 Some churches choose to have their windows made in a new design with new artwork. 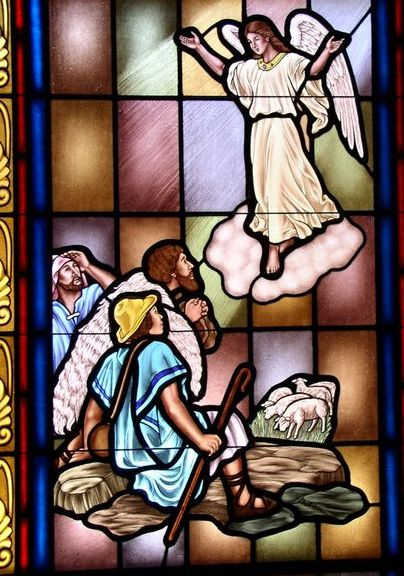 Many churches decide to have their windows similar to an existing design or another church that they have visited. The first part in decision process is choosing their leaded window type: opalescent, cathedral, or hand-stained. They choose their design and/or style. Then they decide whether they want artwork in the window. If they want artwork, then they choose what size and shape. Below are the size and shapes of the standard artwork that we provide. 28" x 42" hand-stained glass medallion of "The Sermon on the Mount"
18" x 26" hand-stained glass medallion of "Boy in the Workshop"
Large floating scene of "Calling the Disciples"
Floating figure of "Come Unto Me"
Small floating symbol of "The Holy Spirit"
Small floating symbol of "Creation"